← Who is this man….. So, I take it that D means Disqualified. Having 8 entrants disqualified out of 24 seems a bit excessive for a Fun event.i propose that disqualification be reserved for only very serious misdemeanours, and not for minor things, like straying over the boundary. 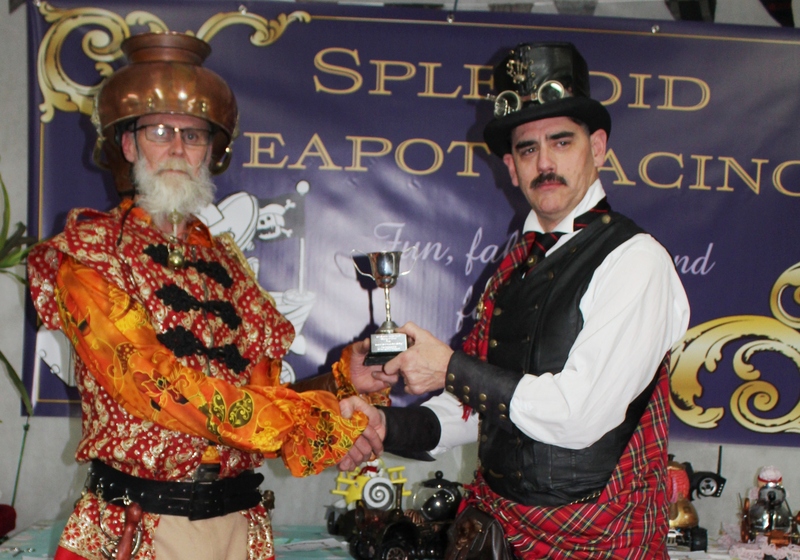 It can be a serious disgrace to be out on your first Teapot Race and be Disqualified in front of all your friends ! Hi Alec, thanks for the comment, I have thought about what you have suggested and if you can hold the attention of people for a whole day, then, by all means, let people continue to race and take as long as they like and have as many goes as they want. At Oamaru, we have one and one-half hours to get the show done and dusted. So I propose that we continue as we have for the last 3 years and in the manner prescribed in the rules at an event that has 20 plus entrants. Timing is important, otherwise, the audience gets up and leaves out of boredom and squiggly kids. As this is as much a spectator sport as a competitor sport their contribution and engagement is important. A few rules never hurt anyone and the rules are applied or not to differing situations. I.e. we may give extra time to an assisted living person or a junior, but not to someone who has had their 5 assists and out of bounds.Thanks.